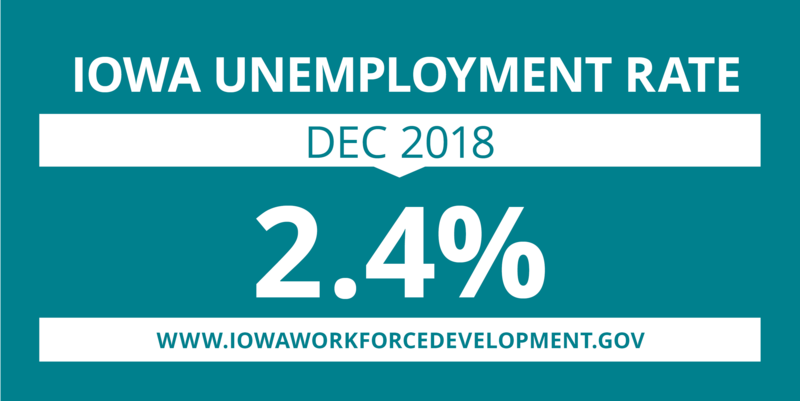 Iowa’s seasonally adjusted unemployment rate remained at 2.4 percent in December. The state’s jobless rate was 2.9 percent one year ago. The U.S. unemployment rate rose to 3.9 percent in December. The number of unemployed Iowans remained at 40,600 in December. The current estimate is 8,700 lower than the year ago level of 49,300. 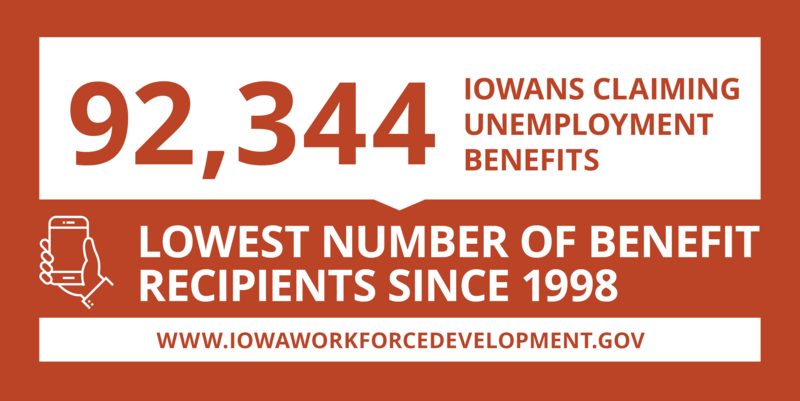 The total number of working Iowans increased to 1,651,300 in December. This figure was 2,300 higher than November and 25,700 higher than one year ago. In December, Iowa’s establishments continued to expand payrolls leading to an increase of 3,900 jobs. Following a revision upward in November, jobs have now been added in three consecutive months for the state. Most segments of Iowa’s economy showed promise to end the year, although construction did contract following a later-than-usual building season. In total, goods producing sectors (generally construction and manufacturing) have fueled most of the state’s growth in 2018 and have been responsible for four out of five jobs added during the calendar year. Government advanced by 1,100 jobs since last year and was up 600 jobs compared to November. The education and health services super sector added the most jobs since November (+1,500) and was fueled by expansion in the health care and social assistance sector. This gain follows two months of little movement in the combined super sector. Leisure and hospitality also grew in December with 1,300 jobs added. This month’s gain was partially fueled by hiring in accommodations and food services which had previously shed jobs in every month since June. Manufacturing continues to beat expectations and again hired more workers in December (+1,200). Both durable and nondurable goods factories had a prosperous year in 2018 and bolstered staffing levels to accommodate increased demand for goods. Alternatively, all was not positive in December, as construction continued to pare off the remainder of the seasonal employees. This loss of 1,900 jobs this month was not unexpected as this sector added jobs in every month from February through October. The only other notable loss this month was from the retail sector (-200) which extended its streak of four consecutive months of declines. In total, 15,500 jobs have been added over the past twelve months. 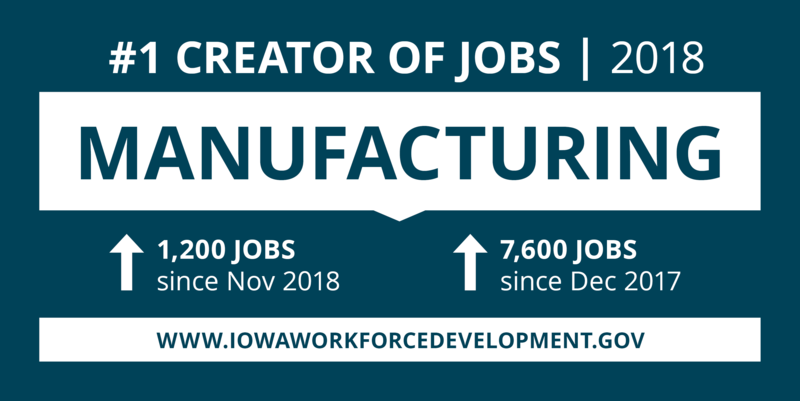 In that time, manufacturing maintained its status as the number one creator of jobs throughout 2018, ending the year at 7,600 jobs higher than last December. Both durable and nondurable goods shops have added staff over that span. Construction industries have also fared well annually (+5,100) despite a sizable decline this month. The only notable loss over the past twelve months is a drop in accommodations and food services (-4,500). MEDIA ALERT: Click here to access an audio cut of comments about Iowa's labor market situation. Local data for December will be posted to the IWD website on Wednesday, January 23, 2019. Statewide and local data for January 2019 will be released on Monday, March 11, 2019.